This is quick, easy and very tasty. 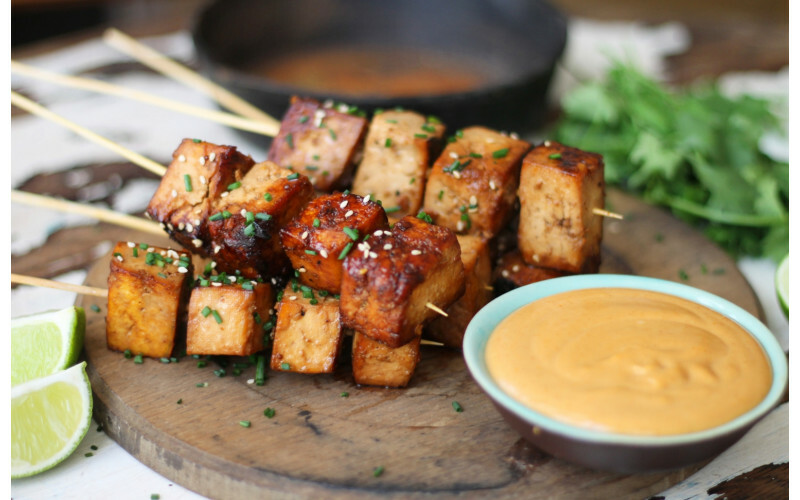 I love to make it with smoked tofu, but you could also use the original type – or, make it really easy for yourself and use the ready-marinated type and leave out this stage of the recipe! NB Cauldron smoked tofu available from large supermarkets – or try your local health store, which may also stock other brands of smoked tofu. . Put the tofu cubes into a shallow bowl. Mix together the marinade ingredients and pour over the tofu, stir gently then leave for at least 2 hours. When you are ready to cook, preheat the oven to 200oC/400oF/Gas Mark 6. Drain the tofu, reserving the marinade. Put the tofu cubes on a lightly-oiled baking sheet, in a single layer, and roast in the oven for 25-30 minutes, until they have browned well and are fairly crisp. Put the pieces of creamed coconut into a small bowl and add the boiling water. Stir until the pieces have melted to a cream. Add the peanut butter, garlic and a dash of soy sauce to taste if you like. Season with salt as necessary and serve with the tofu.